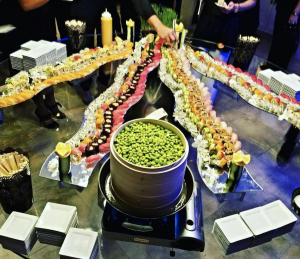 We all know that the best part (other than being out of the office, and the totally on point content, obvs) of a corporate event is the catering… What you eat, how you eat it and how its displayed will end up on Insta, so it’s vital that this is done right – no one wants a negative hashtag associated with them! Everyone loves a good chip (especially with a bit of salt and vinegar) but they are historically a nightmare – no-one wants a soggy chip, or worse, the burnt ones from the bottom of the tray. 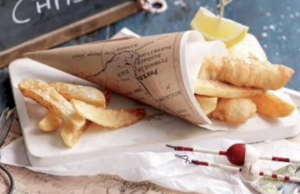 BUT, stick them in beautiful paper cones and you not only avoid the dreaded soggy bottom, but they look super chic too. Buffets are still a great way of offering a range of foods to suit a large group of people, however we’ve moved on a long way from cheese and pineapple on sticks pushed into a foil wrapped melon. 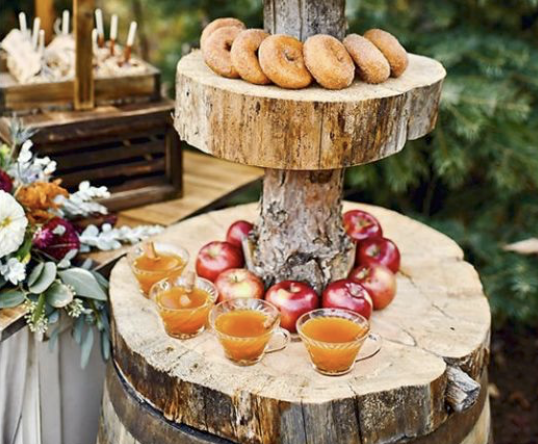 These tree displays look fab, add a bit of height and interest to your food area and also a way of making even the most mundane food look interesting. Sausage roll, anyone? 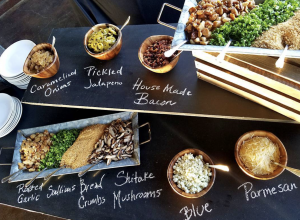 A chalkboard, the mainstay of an artisan market, can also revolutionise your buffet table, and is a quick and easy way of making sure your vegetarians aren’t accidently chowing down on a bacon filled quiche. They can also be reused so are money well spent and more sustainable – you’re welcome. A bit more of a statement this one, but if you have vision and space, it looks amazing. As a rule, puddings are never a tough sell, but this creates a real talking point. 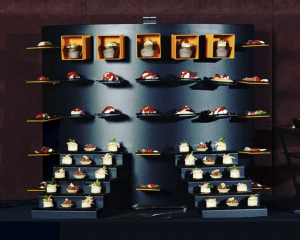 Your deserts need to match their surroundings though, and remember, you might need to give your guests a little push to start eating what looks like a work of art. If you want a real showstopper, ice is your friend. 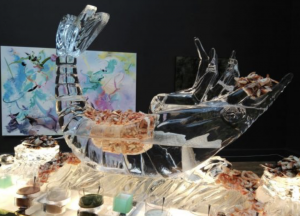 Use it to serve salads on, hover suspended shellfish above it, or create a real spectacle with a cascading luge. You can even have client logos etched into it. And this is just the tip of the iceberg…. If you’re serving bowl food or canapes, spoons offer a stylish, and more importantly, easy to eat display option for guests who may be dressed in their finery and not take kindly to dribbling a bit of gazpacho down their chin. Either fill larger spoons with tasty treats, or present the spoon on a small display plate. … or lines, squares, hearts – whatever you like! 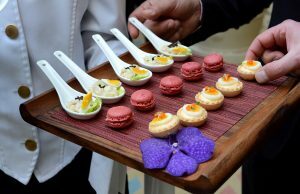 The bonus of serving food this way is that it becomes food in the round – a more theatrical experience, if you like. You remove the bottlenecks that can easily occur and this also gives you the chance to experiment with colour, shape and size.